14. CD rate on Bituminous coal and other coal equalized @ 5%. signatory to the HS Convention is obliged to adopt the HS 2017, incorporated its nomenclature/New HS Codes in Pakistan Customs Tariff with addition, creation and deletion of local PCT codes and also made relevant changes in the Fifth Schedule and SROs/notifications where HS Codes have changed. threshers up to 5 years old while 10% and 20% RD levied on five to ten years and more than ten years old respectively. broadcast transmitter and Reception apparatus etc. extended till 30.6.2018.
from the condition of ‘local manufacturing’ till 30th June 2017 which is extended till 30 th June, 2018. 1. Reduction of sales tax on fertilizers to replace subsidy. Due to complications in payment of subsidy to fertilizers manufacturers and importers, the subsidy is proposed to be substituted with reduction in sales tax rates on various fertilizers. Instead of ad valorem rates, specific rates have been proposed. However, the rate on urea fertilizer shall remain unchanged at 5% ad valorem. Enforced through Finance Bill, 2017, effective from 01.07.2017. 2. Reduction in rate of sales tax on poultry machinery. Sales tax on import of seven types of poultry machinery is proposed to be reduced to 7%. Enforced through Finance Bill, 2017, effective from 01.07.2017. 3. Exemption from sales tax on combined harvesters. Presently, combined harvesters are subject to sales tax at 7% ad valorem under Eighth Schedule. It is proposed to provide exemption from whole of sales tax on combined harvesters upto five years old by inserting an entry in the Sixth Schedule. Enforced through Finance Bill, 2017, effective from 01.07.2017. 4. Exemption from sales tax on agriculture diesel engine. Sales tax on agricultural diesel engines (from 3 to 36 HP) is proposed to be exempted. Enforced through Finance Bill, 2017, effective from 01.07.2017. 5. Exemption from sales tax on imported seeds for sowing. Presently, imported oil seeds are subject to sales tax @ 5% under Eighth Schedule. Exemption from payment of sales tax is being provided on import of sunflower and canola hybrid seeds meant for sowing. Enforced through Finance Bill, 2017, effective from 01.07.2017. 6. Exemption from sales tax on multimedia projectors. Exemption from sales tax is being provided on import of multimedia projectors by educational institutions. Enforced through Finance Bill, 2017, effective from 01.07.2017. 7. Exemption from sales tax on gifts and donations. Exemption from sales tax is being provided to gifts and donations received from foreign governments and organizations to the Federal and Provincial Governments and public sector organizations. Enforced through Finance Bill, 2017, effective from 01.07.2017. 8. Exemption from extra tax to lubricating oil. In order to enable industrial consumers to avail input tax adjustment on lubricating oils purchased from the traders, the entry relating to lubricating is being omitted from Chapter XIII of the Sales Tax Special Procedures Rules, 2007, thus withdrawing the levy of 2% sales tax on lubricating oils. Enforced through amendment of the Sales Tax Special Procedures Rules, 2007 with effect from 01.07.2017. 9. Reduction in sales tax on import and supply of hybrid electric vehicles. Enforced through amendment SRO ____(I)/2017, dated 01.07.2017, effective from 01.07.2017. 10. Automatic stay against recovery. It is proposed to provide for automatic stay against recovery against recovery of Sales Tax and Federal Excise Duty demand till decision by the Commissioner Inland Revenue (Appeals) subject to 25% of the amount of sales tax and FED demand. 11. Exemption from sales tax on premixes to fight growth stunting. It is proposed to provide for exemption from sales tax on premixes to fight growth stunting. Enforced through Finance Bill, 2017, effective from 01.07.2017. 12. Exemption to vehicles for development of Gwadar Port. It is proposed to provide exemption from sales tax to vehicles for construction and development of Gwadar Port and Gwadar Free Zone on the line of exemption available to vehicles under the Customs Act, 1969. Scope of exemption already provided to materials and equipment, is being clarified by extending exemption to plant, machinery, equipment, appliances and accessories. Enforced through Finance Bill, 2017, effective from 01.07.2017. 13. Exemption from sales tax to items for renewable sources of energy. Existing exemption available to items for renewable sources of energy is proposed to be aligned with exemption available to these items under the Customs Act, 1969. 14. Exemption from sales tax to items for conservation of energy. Exemption from sales tax is proposed to be provided to items for conservation of energy on the pattern of exemption available under the Customs Act,1969. 15. Exemption to parts and components for manufacturing LED lights. Exemption is proposed to be provided to parts and components for manufacturing LED lights on the pattern of exemption available under the Customs Act, 1969. Enforced through Finance Bill, 2017, effective from 01.07.2017. 16. Withdrawal of sales tax withholding. Sales tax withholding is proposed to be withdrawn on supplies from registered persons to other registered persons with the exception of advertisement services. 17. Reduction in Federal Excise Duty on Telecommunication Services. Federal Excise Duty on telecommunication services is proposed to be reduced from 18.5% to 17%. 18. Services under Islamabad Capital Territory (Tax on Services) Ordinance, 2001. Services which are subject to sales tax on the basis of turnover without input tax adjustment under Provincial Sales Tax Laws are proposed to be taxed in the similar manner. Exemption from sales tax is also proposed to be provided on export of IT services. 19. Rationalization of sales tax on mobile phones. Mobile phones are chargeable to sales tax at the rates of Rs. 300, Rs. 1,000 and Rs. 1,500 per mobile phone set depending upon categories of mobile phones. It is proposed to merge sales tax rates of Rs. 300 and Rs. 1,000 per set into Rs. 650 per set. The proposal will promote use of information technology and will also reduce disputes on categorization of mobile phones. Enforced through Finance Bill, 2017, effective from 01.07.2017. 20. Increase in Federal Excise Duty on cement Federal Excise Duty on cement is proposed to be enhanced from Rs. 1 per kg to Rs. 1.25 per kg. 21. Enhancement of rates of Federal Excise Duty on cigarettes. cigarettes of inferior quality, a new tier is being introduced and the proposed duty structure for the three tiers. Enforced through amendment SRO ____(I)/2017, dated 27.05.2017, effective from 27.05.2017. 22. Rate of sales tax for steel sector. Steel sector is currently paying sales tax on the basis of consumption of electricity at the rate of Rs. 9 per unit of electricity. The existing rate of Rs 9/unit of electricity is proposed to be enhanced to Rs.10.5 and corresponding increase shall be made in ship breaking and other allied industry. And to promote the ease of doing business the issues pertaining to steel industry shall be resolved in consultation with the industry. under obligation to pay sales tax under normal regime. regime had been introduced under an SRO which has been struck down by the Lahore High Court. It is proposed to provide for payment of sales tax by tier-1 retailers through Sales Tax Act, 1990. Enforced through Finance Bill, 2017, effective from 01.07.2017. 24. Payment of sales tax on retail sales of five export oriented sectors. Retail sales of five export oriented sectors are chargeable to sales tax @ 5%. It is proposed to increase the said rate to 6%. 25. Sales tax on commercial import of fabrics. Commercial import of fabrics is zero-rated under SRO 1125(I)/2011 dated 31.12.2011. It is proposed to levy sales tax @ 6% on commercial import of fabrics. Enforced through amendment SRO ____(I)/2017, dated 01.07.2017, effective from 01.07.2017. 26. Clarificatory amendment regarding application of sales tax on imports. Goods imported into Pakistan are subject to sales tax. However, in order to clarify the matter in view of some court judgments Clarificatory amendment is being made to section 3 regarding application of sales tax on imports destined for non-tariff areas. Enforced through Finance Bill, 2017, effective from 01.07.2017. 27. Removing ambiguity regarding application of further tax in respect to persons making zero-rated supplies. Clarificatory amendment is proposed to be made regarding application of further tax under section 3(1A) on zero-rated supplies covered under section 4 of the Sales Tax Act, 1990. However, zero-rated supplies made to diplomats, privileged persons, duty free shops and similar categories shall be excluded from the purview of further tax. 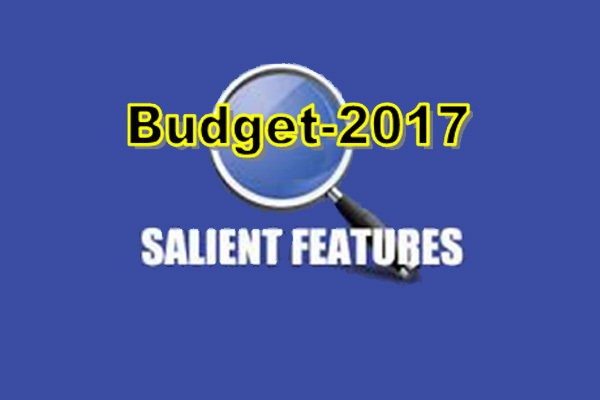 Enforced through Finance Bill, 2017, effective from 01.07.2017. 28. Inclusion of Inland Revenue Authorities. District Taxation Officer, Deputy/Assistant Director Audit are proposed to be included in the list of Inland Revenue authorities Enforced through Finance Bill, 2017, effective from 01.07.2017. 29. Assigning of jurisdiction of sales tax to Chief Commissioners Inland Revenue. Presently, Federal Board of Revenue assigns jurisdiction of Sales Tax and Federal Excise directly to Commissioners Inland Revenue. It is proposed that the Federal Board of Revenue may assign jurisdiction to Chief Commissioners Inland Revenue who may further assign jurisdiction to Commissioners Inland Revenue under his administrative control. Enforced through Finance Bill, 2017, effective from 01.07.2017. 30. Service of electronically sent notices to companies be construed as proper service. Notices sent to companies through electronic medium is proposed to be treated as proper service alongwith other prescribed modes. 31. Fixation of minimum sales tax on supply of locally produced coal. Minimum sales tax @ Rs. 425 per metric tonne is proposed to be provided for locally produced coal. Enforced through Finance Bill, 2017, effective from 01.07.2017. 32. Penalties are proposed to be imposed on persons manufacturing, possessing, transporting, distributing, storing, selling non-duty paid/ counterfeit cigarettes. Reduction in Tax Rate for Companies: Continuing with the policy of reducing corporate tax rates, the rate has been reduced further from 31% to 30% for the Tax Year 2018. The number of mobile phone subscribers in Pakistan has shown a gradual and sustained increase and presently there are about 140 Million mobile telephone subscribers in Pakistan belonging to various strata of society. In order to promote mobile phone density, the rate of withholding income tax for mobile phone subscribers is being reduced from 14% to 12.5%. ? Introducing concept of start-ups: In order to promote innovation and entrepreneurship in Information Technology the concept of start-up has been introduced. A start-up has been defined as a business set-up by an individual, AOP or a company having turnover upto Rs.100 Million, registered and certified by the Pakistan Software Export Board (PSEB) as an information technology entity engaged in offering technology driven products or services to any sector of the economy. In order to incentivize the start-ups, tax exemption is being accorded to profits earned by such start-ups for a period of three years. Moreover, exemption from levy of minimum tax as well as withholding tax (as recipient) is also being accorded to such start-ups. Exemption on cash withdrawal by branchless banking agents: At present, tax @ 0.3% and 0.6% is deducted upon aggregate cash withdrawals exceeding Rs.50,000 per day from filers and non-filers respectively. In order to promote digital payments in the country and to assist in the realization of the long term vision of Universal Financial Inclusion in Pakistan, exemption is being accorded to branchless banking agents operating under the Asaan Mobile Account Scheme from withholding tax on cash withdrawals made for the purpose of making payments to their respective customers. Exemption from collection of advance tax on vehicles leased under the Prime Minister’s Youth Loan Scheme: At present, advance tax @ 3% is collected at the time of leasing motor vehicles to a non-filer. In order to facilitate the generation of employment opportunities among the unemployed youth and to mitigate their hardship, exemption from collection of advance tax is being accorded to vehicles leased under the Prime Minister’s Youth Loan Scheme. certificate issued by the Commissioner, is being enhanced from 110% to 125% of the quantity imported and consumed in the previous tax year. Further relief on tax credit for education expenses: At present, individuals having taxable income of less than one million rupees are entitled to a deductible allowance in respect of education expenses incurred by them. In order to provide respite upto middle income groups paying tuition fees, the threshold of taxable income for individuals entitled to a deductible allowance in respect of education expenses incurred is being increased from Rs.1,000,000/-taxable income to Rs.1,500,000/-. Relief from Withholding tax on Life Insurance Premium: Presently, advance tax is collected by insurance companies from non-filers if life insurance premium paid by such non-filers exceeds Rs.200,000/- per annum. In order to provide respite to taxpayers having life insurance policies the threshold for collection of advance tax from such non-filers is being enhanced from Rs.200,000/- to aggregate amount of Rs.300,000/-per annum. Relief for individuals and AOP’s paying health insurance premium /contribution: At present a resident person other than a company, deriving income from salary or business and being a filer is entitled to a tax credit in respect of any health insurance premium or contribution paid to an insurance company. In order to provide respite to individuals and AOP’s availing health insurance the lower limit of tax credit available to such persons, on a proportionate basis, is being increased from Rs.100,000/- to Rs. 150,000/-. In order to encourage and incentivize compliant taxpayers, being filers of income tax returns, withholding tax on registration and transfer of motor vehicles having engine capacity upto 850cc, 851cc to 1000cc and 1001cc to 1300 cc is being reduced from existing Rs.10,000/-, Rs.20,000/- and Rs.30,000/- to Rs.7,500/-, Rs.15,000/- and Rs.25,000/- respectively. Loan to employee by employer: A present interest free loan exceeding Rs. 0.5 Million provided by an employer to an employee is treated as a perquisite and is subjected to tax in the hands of the employee. In order to provide relief to such employees it is proposed to enhance this limit of interest free loans from the existing 0.5 Million to 1 Million. At present, upon enlistment of a company in the stock exchange, 20% tax credit for a period of two tax years is available on the tax payable by such company. In order to further incentivize the enlistment of companies on the stock exchange such tax credit is being extended for another two tax years, however, such tax credit shall be allowed @10% of the tax payable for each of these subsequent two tax years. Reduced rate of minimum tax on services rendered by the Pakistan Stock Exchange: Presently, services rendered by Pakistan Stock Exchange Limited are subjected to 8% minimum tax which results in an effective tax rate which is much higher than the prevalent corporate rate of tax. To further improve the performance of the Stock Exchange it is being subjected to reduced rate of minimum tax @ 2% on its services. Limit for sales promotion by pharmaceutical companies to be enhanced: A provision was introduced in the Finance Act, 2016 whereby expenditure incurred by pharmaceutical companies on sales promotion, advertisement and publicity, in excess of 5% of turnover was to be treated as an inadmissible expense. In view of the difficulty being experienced by pharmaceutical companies in carrying out their normal business activities the limit for expenditure incurred by such companies on sales promotion, advertisement and publicity is being enhanced from 5% to 10% of turnover. In order to promote and incentivize Islamic Banking, special provisions have been introduced whereby tax neutrality has been accorded in the case of Musharika financing by extending the benefit of depreciation on assets co-owned in the case of a Musharika arrangement. Fixed tax by Hajj Group Operators: At present Hajj Group operators are paying Rs.5000/- per Haji in respect of income from Hajj operations. In order to facilitate Hajj Group operators the fixed tax of Rs.5000/- per Haji is being extended for the Tax Year 2017. Exemption to income of political parties: At present there is no specific exemption in the law in respect of income of political parties. As a relief measure, exemption is now being proposed on income of all political parties registered with the Election Commission of Pakistan under the Political Parties Order, 2002.
exemption from tax on the undistributed reserves of a public company, other than a banking company or a modaraba if the lesser of at least 40% of after tax profit or 50% of the paid up capital is distributed as dividend. In order to protect the interest of small investors and to promote payment of 17 dividends the condition regarding distribution of 50% of paid up capital is being omitted. Concept of provisional assessment to be abolished: At present, there is no right of appeal against a provisional assessment order which attains finality after the expiry of 45 days from the date of service of such order if the taxpayer fails to furnish a complete return of income. In order to alleviate the hardship being faced by various taxpayers who are unable to file return of income within 45 days on account of genuine reasons and have no remedy against such order, the concept of provisional assessment is being done away with. Revision of withholding tax statements: Presently taxpayers are unable to revise withholding tax statements in case of any error /omission. In order to facilitate taxpayers, a new provision is being introduced enabling taxpayers to revise withholding tax statements suo-moto within 60 days of the filing of withholding tax statements. Empowering Chief Commissioner to revise order refusing extension in filing of tax return and statements: At present there is no remedy available to a taxpayer if the concerned Commissioner refuses to grant extension in filing of an income tax return, or a wealth tax statement. In order to facilitate such taxpayers, the Chief Commissioners are being empowered to revise an order by a Commissioner refusing to grant such extension. The present the rate of withholding tax on sale /supply of Fast Moving Consumer Goods is 3% and 3.5% respectively for companies and non-companies. Distributors of Fast Moving Consumer Goods typically have high volumes but low profit margins, therefore, the incidence of withholding tax at the present rates causes undue hardship for such distributors. In order to mitigate their hardship, the rates of withholding tax are being reduced to 2% and 2.5% respectively for companies and non-companies. dividend income is on the lower side as compared to most other countries in the region. It is proposed that the rate be increase to 15%. Furthermore, rate of tax on dividend received from mutual funds is being rationalized and enhanced from existing 10% to 12.5%. transactions, a flat /single rate of tax of 15% for filers and 20% for non-filers is being introduced. documentation. In this backdrop this tax credit is being withdrawn. Rationalizing minimum tax: At present the standard rate for minimum tax is 1% of turnover. In order to facilitate and encourage the organized and compliant sector to making correct declarations of their taxable income and tax liability thereon, the rate of minimum tax is being enhanced from 1% to 1.25%. Tax on Builders and Developers: Vide the Finance Act, 2016 a fixed tax on builders and developers on the basis of developed or built up area was introduced at different rates for various cities across the country. The departure from normal tax regime to fixed tax regime did not yield the expected results, therefore, it is proposed that the normal tax regime be reintroduced for land developers and builders. discharge of tax liability for commercial importers whereas the same is adjustable for urea manufacturers who also commercially import DAP fertilizer. In order to rationalize this disparity and for the sake of uniformity, commercial import of DAP fertilizer both by commercial importers as well as urea manufacturers is proposed to be brought into the final tax regime. proposed to extend the levy of Super Tax by one more year, i.e. for the tax year 2017. Advance Tax on Stock Exchange Brokers: Currently the rate of advance withholding tax collected from stock exchange brokers is 0.02% and is adjustable. This withholding tax is now being made final tax in respect of such persons. Documentation of Purchase of Tobacco: Illicit and non-duty paid cigarette manufacturing has created distortions. In order to document purchase of tobacco, Pakistan Tobacco Board is being entrusted with collection of withholding tax on purchase of tobacco by manufacturers of cigarettes at the rate of 5% of the purchase value of tobacco, at the time of collecting cess. adjustable withholding tax at the rate of 0.5%. It is proposed to enhance the tax rate to 1%. manufacturers/commercial importers are required to collect withholding tax on sale to dealers, distributors and wholesalers on sale of various items such as electronic goods, cigarettes, etc. at the rate of 0.1% of such sales. The scope of this withholding tax is being extended to batteries. Similarly, every distributor, dealer, wholesaler while making sales to retailers in respect of the above referred commodities are required to collect withholding tax at the rate of 0.5% of the amount of sales. The scope of this withholding tax is being extended to batteries. Increasing cost of non-compliance with tax laws: The government, since the preceding three years, has consistently adopted the policy of creating a distinction between compliant and non-compliant taxpayers by prescribing higher withholding tax rates for non-filers and resultantly increasing the cost of doing business for such non-filers. Continuing with this policy the differential of withholding tax rates for filers viz-a-viz non-filers, is being enhanced in scope and rates for various transactions including, payments made to residents and non-resident persons for sales/services/contracts, payments for prize bond/lottery, sale by auction, commission/discount to petrol pump operators etc.